Hello there lovely people! Today's project is something fun, special and exciting (at least to me). A dear friend is having her first child, and it's a little girl! 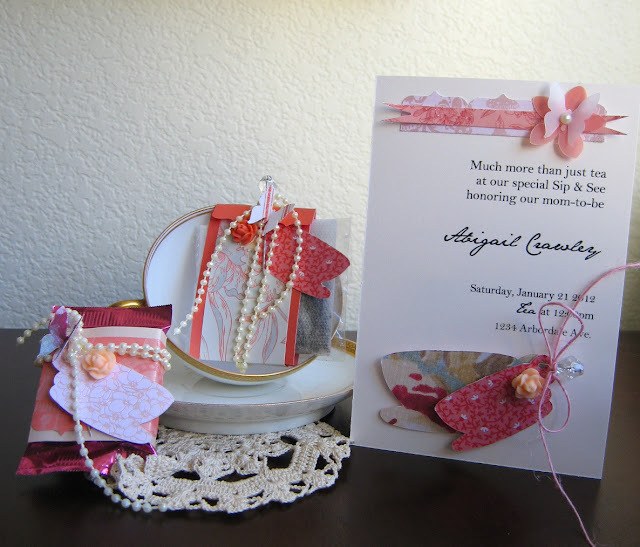 So, I was thinking baby shower and patterned paper--what could be better than a project featuring a baby shower invitation and favors?I love baby showers that are tea-themed. They're girly, fun and sophisticated; a great opportunity to celebrate being a woman and femininity. Plus, I love those little tea cakes and sandwiches. The invitation is so easy to make. 1.Create the text in a word processing program, trim your border and notched paper strips and adhere. 2. Die cut teacups from the Promise Me Collection. 3. Adhere teacups and embellies! Sometimes less is more---lots of variety in patterns, but done in moderation like banners and die cut shapes make the elements POP! Die cut teacups from patterned paper as tags to add to the invitation and favors; it'll tie the two together creating some cohesion and unity.Use accents that repeat like the resin roses, pearl trim, trinket pins and butterflies.And finally, be inspired by what you have around the house--I had extra yummy tea and chocolates; the perfect favor for a Baby tea party. Love the top of the card with the strip and butterfly... very pretty and delicate. Emilyyy :) Hey girl!... I finally got a chance to check out your blog. Your work is superrr cute! I love your projects and this invitation is just gorgeous. The dimension and colors look so feminine and pretty! It was SO nice meeting you at CHA. You were so sweet and friendly. Hope we keep in touch!